Voices for Freedom for Tyrend Goins, Sr. Please join my children, my friends and me in trying to resolve this situation. 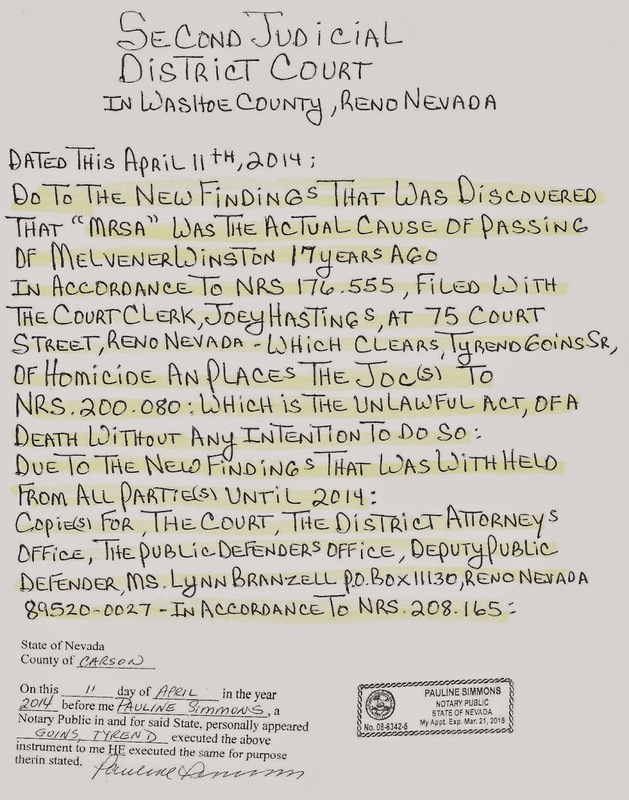 In April 2014, an agreement was signed with the judge, the district attorney’s office and the public defender’s office and notarized by all parties. We have not received a response from the Court since April 11, 2014 . The agreement was for time served (NRS 200.080). We are looking for any help you may be able to offer. Please contact Dr. Cesar and Rita Minera at (775)-825-4446 at Word of Life. Copies of the agreement were sent to KOLO 8 News in Reno-Sparks. “A Nevada inmate died last month at Summerlin Hospital of a medical condition, according to Corrections Department officials. If you are a journalist, please try to find out if there is a lack of medical care, or a reason why so many people in Nevada’s prisons die of medical conditions. Thank you. Why is Tyrend Goins, Sr still in prison after it was ORDERED that he is immediately released from custody? 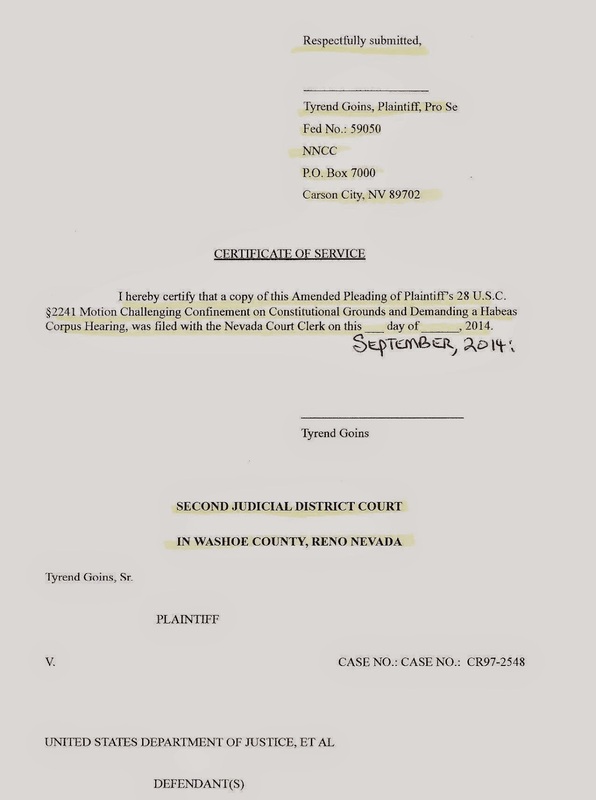 We received documents from Tyrend Goins, who has been in Nevada’s prison system for 17 years on a charge which was recently nullified due to newly discovered evidence, exculpating him from the original charge against him. Tyrend is however still in prison! This cannot be right! Nevada is holding a man whose charge was nullified. Surely NDOC should not let this injustice and this costly situation remain as it is! The Judge even granted Tyrend’s Amended 28 U.S.C. 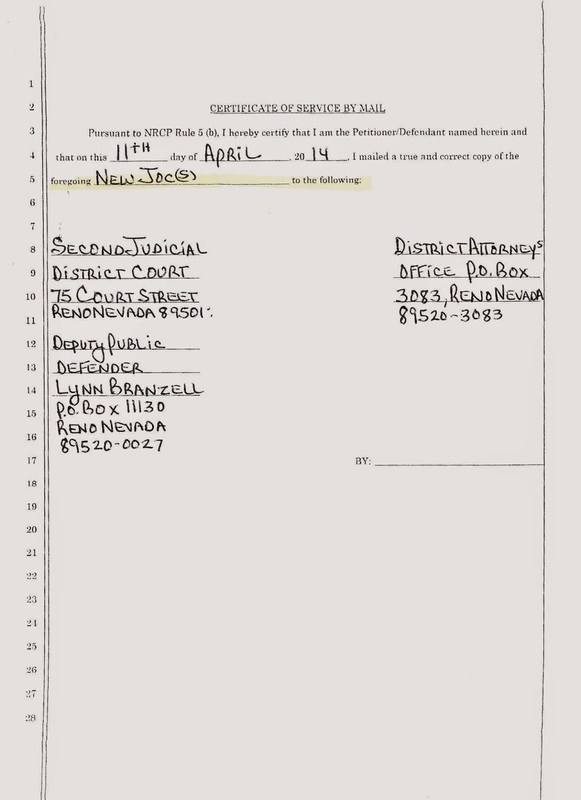 par 2241 Motion in September of 2014, and orders that he is immediately released from custody prison. “The truth is out that I did not kill Melvener Winston. MRSA was the cause of her passing. I want my mother’s side to know the truth. My six children and five grandchildren want to meet their relatives. My grandfather is Joseph Dillion. My grandmother is Kay Francis. They lived in the San Francisco area. My mother, Brenda, was the first of their eight children, who were born between 1957 and 1969 in San Francisco General Hospital. The only other names I remember are Nadeen and Darlene. Below are the documents as hyperlinked above. We ask those in power to investigate this injustice and to not allow an innocent man to be incarcerated one day longer! 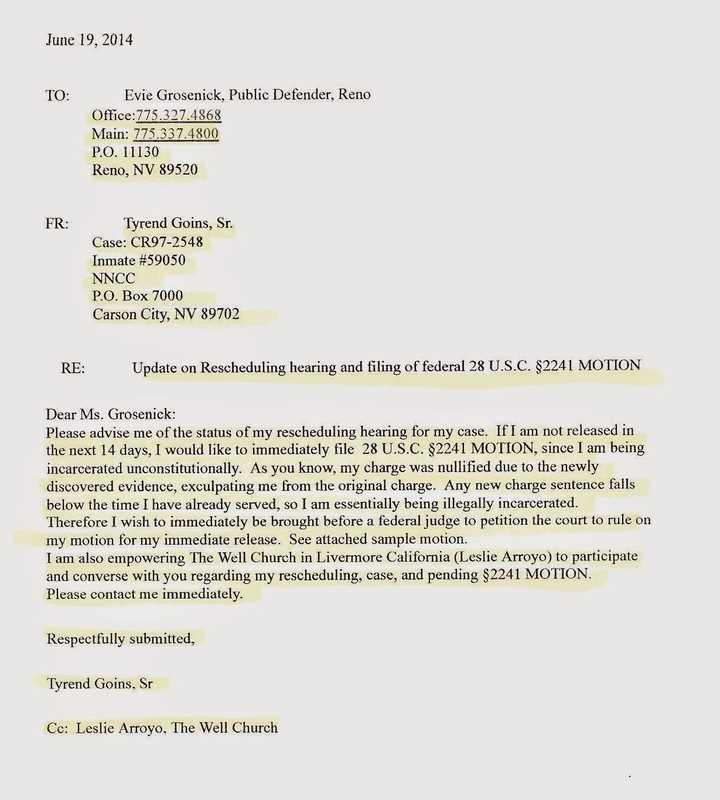 Tyrend Goins Letter to Public Defender Evie Grosenick, Reno, Nevada, June 19th 2014 on filing a federal 28 U.S.C. paragraph 2241 Motion. Tyrend Goins filing his federal 28 U.S.C. paragraph 2241 Motion Challenging Confinement on Constitutional Grounds and Demanding a Habeas Corpus Hearing, September 2014. Tyrend Goins’ federal 28 U.S.C. 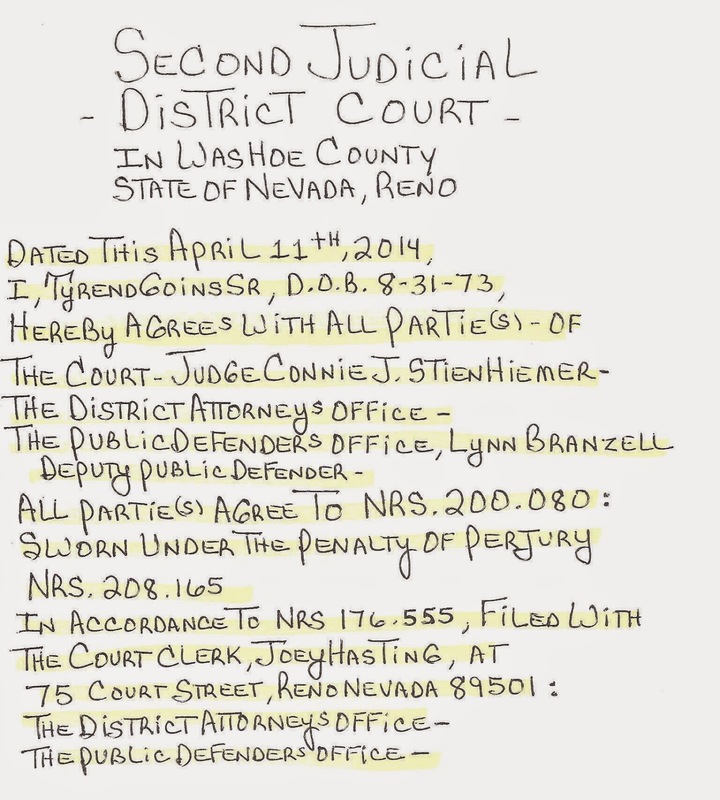 paragraph 2241 Motion granted, September 2014 ORDERED that Plaintiff is immediately released from custody prison. This is from a text from the American Bar Association (ABA) Criminal Justice Section, in a recommendation to the House of Delegates, concerning effective monitoring of prisons. It was written in 2008, and Nevada Cure thinks that this should be implemented in Nevada and everywhere else. This type of MONITORING is exactly what is needed in Nevada. We believe the independent ombudsman would serve this purpose. Please pass the Ombudsman Bill introduced by Senator Segerblom. Here you can find Minutes of the Advisory Commission on the Administration of Justice Meeting of May 1st, 2014, in which NV-Cure Director John Witherow explained the need for an Ombudsman to monitor NDOC. Alternatively, make NV-CURE an Independent Monitor and give us the power, money and staff that can do the job that needs to be done. Thank you. 1. The monitoring entity is independent of the agency operating or utilizing the correctional or detention facility. 2. The monitoring entity is adequately funded and staffed. 3. The head of the monitoring entity is appointed for a fixed term by an elected official, is subject to confirmation by a legislative body, and can be removed only for just cause. 4. Inspection teams have the expertise, training, and requisite number of people to meet the monitoring entity’s purposes. 5. The monitoring entity has the duty to conduct regular inspections of the facility, as well as the authority to examine, and issue reports on, a particular problem at one or more facilities. grievance processes; substance-abuse treatment; educational, vocational, and other programming; and reentry planning. 7. The monitoring entity uses an array of means to gather and substantiate facts, including observations, interviews, surveys, document and record reviews, video and tape recordings, reports, statistics, and performance-based outcome measures. 8. Facility and other governmental officials are authorized and required to cooperate fully and promptly with the monitoring entity. 9. To the greatest extent possible consistent with the monitoring entity’s purposes, the monitoring entity works collaboratively and constructively with administrators, legislators, and others to improve the facility’s operations and conditions. 10. The monitoring entity has the authority to conduct both scheduled and unannounced inspections of any part or all of the facility at any time. The entity must adopt procedures to ensure that unannounced inspections are conducted in a reasonable manner. 11. The monitoring entity has the authority to obtain and inspect any and all records, including inmate and personnel records, bearing on the facility’s operations or conditions. 12. The monitoring entity has the authority to conduct confidential interviews with any person, including line staff and inmates, concerning the facility’s operations and conditions; to hold public hearings; to subpoena witnesses and documents; and to require that witnesses testify under oath. 13. Procedures are in place to enable facility administrators, line staff, inmates, and others to transmit information confidentially to the monitoring entity about the facility’s operations and conditions. 14. Adequate safeguards are in place to protect individuals who transmit information to the monitoring entity from retaliation and threats of retaliation. 15. Facility administrators are provided the opportunity to review monitoring reports and provide feedback about them to the monitoring entity before their dissemination to the public, but the release of the reports is not subject to approval from outside the monitoring entity. possible solutions to those problems. 17. Subject to reasonable privacy and security requirements as determined by the monitoring entity, the monitoring entity’s reports are public, accessible through the Internet, and distributed to the media, the jurisdiction’s legislative body, and its top elected official. these action plans. The jurisdiction vests an administrative entity with the authority to redress noncompliance with these requirements. 19. The monitoring entity continues to assess and report on previously identified problems and the progress made in resolving them until the problems are resolved. 20. The jurisdiction adopts safeguards to ensure that the monitoring entity is meeting its designated purposes, including a requirement that it publish an annual report of its findings and activities that is public, accessible through the Internet, and distributed to the media, the jurisdiction’s legislative body, and its top elected official. The agenda for the Monthly Meeting on Oct. 29th, 2014 can be found here. John Coldwell passed away – read his letter and learn about his care for others! We learned that John Coldwell passed away on October 2nd, 2014. John was a member of NV-CURE and a prison activist. He recently won a case in the 9th Circuit invalidating the NDOC policy of no cataract surgery for a person blind in only one eye. He will be missed. Please read this letter from earlier this year received by NV-CURE from John Coldwell. This letter reflects the type of person John Colwell was to us. Thank you for reading it. A 67-year-old prisoner at Desert State Prison in Indian Springs has died. Nevada Department of Corrections has confirmed that inmate John Colwell, NDOC #33742, died of a chronic medical condition at the High Desert State Prison. Read more here.